Marc reminds me with this strip how much fun it is to get out of Valhalla. He rendered the snot out of that alleyway! Those with eyes attuned will recognize the boy’s shirt for what it is. Did you see it? Did you see The Avengers? I saw it at the end of a 6 movie Marvel Marathon. Wow. It is possible to become desensitized to big guys pummeling each other. Not that that made the movie less amazing. Hoping to have a full review up soon… not that it matters. You know if you want to see this. I… do not know that reference. Must investigate. First you run out of whiskey and then the space monkeys appear. This day keeps getting worse and worse. Here’s a tip: if you ever start seeing space monkeys, you’re mentally and emotionally in a bad place. hey brock, why would he walk down a dead end? unless he knew they were following him. also what does the sign say on the prison (?) wall? Bad off as Cap is, he wouldn’t litter. He ducked down the alleyway to toss his bottle into a trashcan. I would have given even odds in this fight, but the wrestling singlets on the space chimps tilts the scales in their favor (although Cap’n looks like he could cave in pretty much any scale- dude is circling the drain).. The fight breaks out in the next strip! Even when you are hiding at the bottom of the bottle the space monkeys will find you…oh they will find you. Poor, poor Captian. He has fallen hard. The question is… does he have farther to go? I do believe I feel some monkey business coming on…..
Do those feelings come with a faint banana odor? Because they do for me. I always love the mainuqenn drawings. They are so full of energy and movement. I find it so amazing how a static image can portray movement so well, but animation which doesn’t consider it properly (or live actors in fact) can look stiff and unreal. All my sketches are looking dead at the moment, because I’m concentrating so much on getting the anatomy proportionally correct. It will nice to bring them back to life again. Yup, I’ve read a few reviews that say much the same about the mildeasing cover, and what a shame because I love the cover too, and the fact that it hints at a romance is what makes me love it even more. But yeah, I probably wouldn’t be able to stand Corrine either. She seems to be so stereotypical, and I rather avoid those kind of characters if I can. Thanks for the honest review, Nina. Good question… is Cap a mean drunk? A sad drunk? A funny drunk? As I write this it’s just been revealed that Marvel’s THE AVENGERS has a set a new opening weekend box office record by a wiiiiiide margin. $200.3 million. Take that in. Not only is an Avengers movie actually real, it’s hit the zeitgeist. Well I guess so! The movie plays like gangbusters with an audience. I don’t know when the last time was that I was in a theater where the audience responded so audibly and INVOLUNTARILY to what was happening on screen. Writer/Director Joss Whedon is a man who knows how to weave and twist a scene to both play into and subvert our expectations to great effect. In other words, he knows storytelling. There are moments in THE AVENGERS that demand reaction, and more often than not my reaction was joy. I’m not going to spoil a single great moment for those of you that haven’t seen the movie yet, but when you see them, you’ll know. Sometimes it’s an action beat, sometimes it’s a line of dialogue. It’s always brilliant. Good thing too because this is by no means a perfect movie. I still don’t fully understand villain Loki’s motivation and plan. The movie has no second act. A couple of characters–Hawkeye and Maria Hill–are pretty much non-entities. Nothing about the aliens that populate the film is distinct or driven by character. Everyone at the marathon got a souvenir cup with topper. My wife and I managed to get a full set! I should say that this is not my final word on this movie. I saw it at the end of a 14 hour Marvel Movie Marathon at my local theater. Let me tell you, it is possible to become numb to watching guys hit each other. 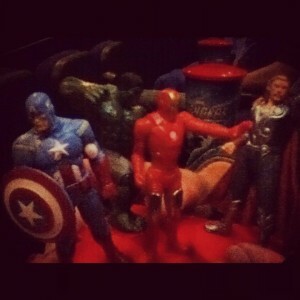 I was bleary-eyed (but amped) as I watched THE AVENGERS. I think a revisit is in order and I won’t have final thoughts about the quality of the film until then. I’m keeping this short because you already know you want to see this (and if you don’t then enjoy not grinning like an idiot) and I don’t want to ruin it. Stop reading now if you haven’t gotten out to the multiplex yet. But, for those of us that have seen it, I’m declaring the comments on this post a SPOILER ZONE. Let’s share our favorite moments and get our geek on and talk about that mid-credits sequence and what it could mean!